Americans spend more than $20 billion a year on supplements in hopes of staving off cancer, heart disease, and dementia. Trouble is, the latest research shows they provide no benefit — and they may even be hazardous to our health. But given our nutrient-deprived diets, should we really stop taking these pills altogether? These are the startling findings of three articles just published in the highly influential Annals of Internal Medicine. The researchers involved in the studies didn't mince words; they're concerned that people are spending too much money on pills that confer no benefit, and in some cases may even be harmful. What's more, they even hinted that companies selling supplements are fueling false health anxieties to offer unnecessary cures. In an editorial titled "Enough is Enough: Stop Wasting Money on Vitamin and Mineral Supplements," Dr. Lawrence Appel of the Johns Hopkins School of Medicine in Baltimore and his co-authors wrote, "Most supplements do not prevent chronic disease or death, their use is not justified, and they should be avoided." Wow. That'll come as a shock to the nearly 40% of adults who regularly take antioxidants, multivitamins, and other supplements. To reach these conclusions, an international team of researchers conducted three different studies. The first was a meta-study that looked at the consumption of a daily multivitamin to prevent cardiovascular disease and cancer in more than 450,000 participants (whoa, that's a pretty decent sample size — one drawn from 24 previous trials). These pills had no discernible effect on mortality. The second study looked into the effects of a daily multivitamin after a heart attack in about 1,700 men and women over an average of five years. No advantage could be found. Although, it needs to be pointed out that more than half of the participants stopped taking their medications, making it difficult for the researchers to draw definitive conclusions. The third study looked into the use of a multivitamin to prevent dementia in nearly 6,000 men aged 65 or older. Again, nada. Nothing. 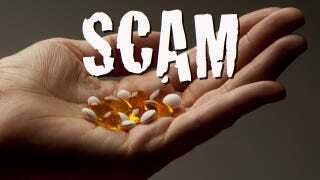 "These vitamins should not be used for chronic disease prevention. Enough is enough," concluded the experts. If that wasn't bad enough, the researchers also found that vitamin E, when taken in large doses, can be harmful. And shockingly, smokers who took beta carotene were at an increased risk of developing cancer. The researchers also said the antioxidants folic acid and B vitamins are harmful or ineffective for preventing chronic diseases. Instead of popping vitamins and minerals, the experts recommended that people should eat more fruits and vegetables, reduce trans fat, saturated fat, and salt, reduce calories, and increase physical activity. Personally, I'm not convinced that we should completely stop taking vitamins and supplements. While I agree that foods packed with nutrients can provide most, if not all, of our dietary needs, the fact of the matter is that many of us eat very poorly. A perfectly balanced diet isn't always possible, leading to nutritional deficiencies. Moreover, vegetarians and vegans are dependant on supplements as a way to get their essential B vitamins. And as the experts themselves admit, supplementation is important for people with deficiencies, malabsorption issues, and to prevent neural tube defects in pregnancy. Lastly, the jury is still out on Vitamin D particularly for those who living in northern, sun-deprived climates, which can strengthen bones. There's also omega-3 fatty acids (including DHA and EPA), which are beneficial to brain health. Finally, there's magnesium supplementation — a cofactor in more than 300 enzyme systems that regulate diverse biochemical reactions in the body, including protein synthesis, muscle and nerve function, blood glucose control, and blood pressure regulation. Read the studies at Annals of Internal Medicine: "Oral High-Dose Multivitamins and Minerals After Myocardial Infarction: A Randomized Trial," "Long-Term Multivitamin Supplementation and Cognitive Function in Men: A Randomized Trial," and "Vitamin and Mineral Supplements in the Primary Prevention of Cardiovascular Disease and Cancer: An Updated Systematic Evidence Review for the U.S. Preventive Services Task Force."